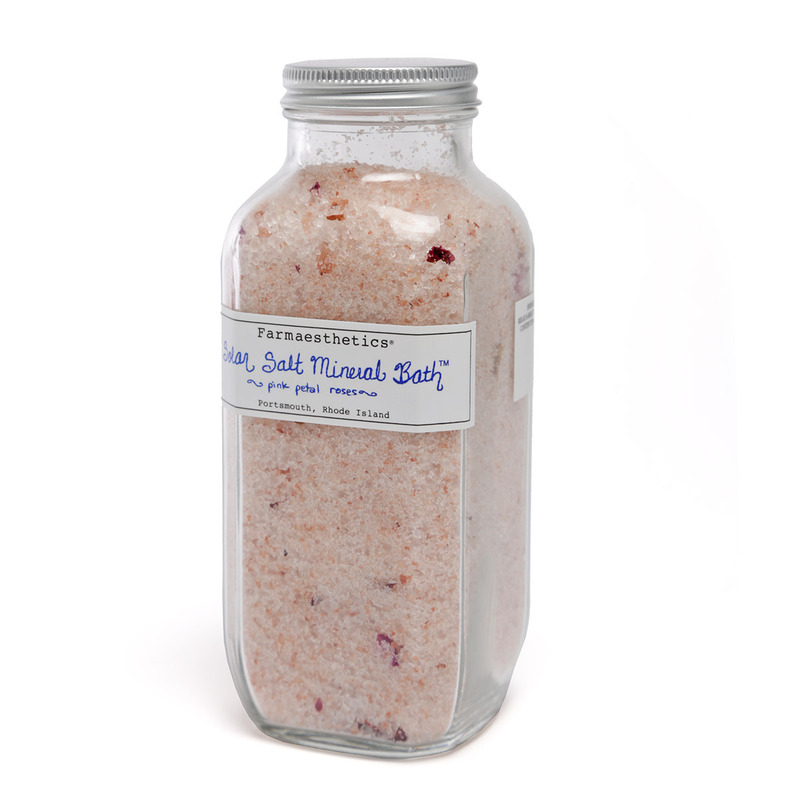 Envelop yourself in a luscious bath of restorative mineral salts, relaxing rose essential oil, and organic rose petals. This treat for body and soul will leave you relaxed and rejuvenated. 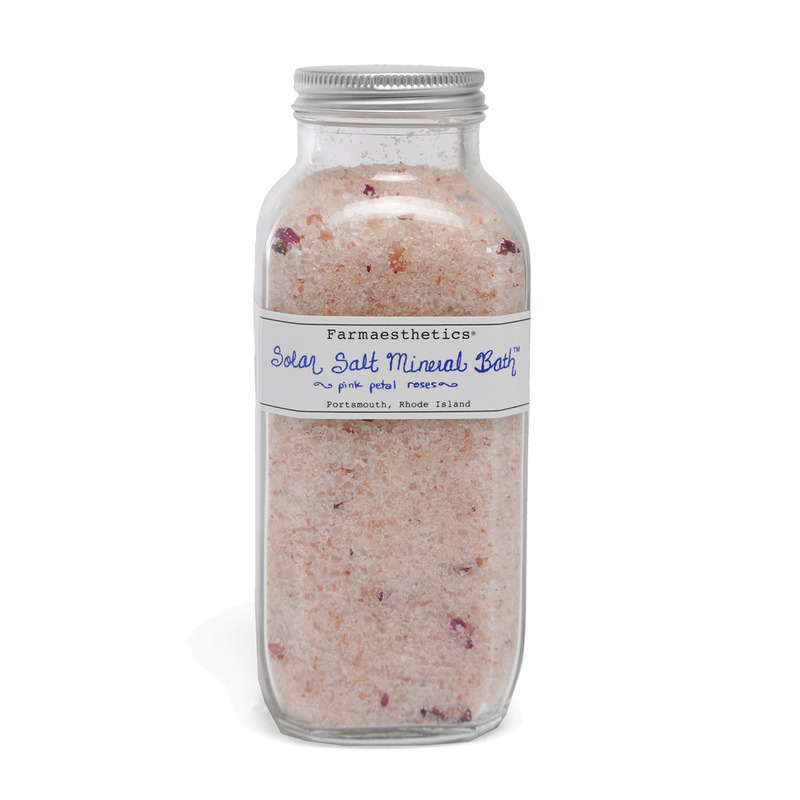 The mix of epsom, pink Himalayan, and sea salts is rich in nutrients and helps pull toxins out of the body, while the rose oil is uplifting and helps relax muscles. The clear glass bottle shows off the simple beauty of this handmade blend. Therapeutic grade high-mineral content epsom, pink himalayan, and sea salts with rose essential oil and organic rose petals. Farmaesthetics products are compliant with NOSB (National Organic Standards Board) recommendations for labeling. Their products are dermatological tested, hypo-allergenic and non-irritating. They do not use any dyes, fillers, artificial preservatives, or petroleum products. In effort to reduce their footprint on the environment they use recyclable, minimal packaging and have incorporated passive solar heating and natural lighting in their warehouse and office facility. Farmaesthetics donates products in regular support of the Imus Ranch for Kids with Cancer and Jane Goodall's Roots & Shoots Conservation Program. Farmaesthetics founder Brenda Brock started selling her handmade herbal skincare products in the summer of 1999. As the daughter of a 7th generation farming family, Brenda Brock has developed a skincare line based off her traditional, organic, herbal recipes. Farmaesthetics uses only 100% natural skincare products with whole ingredients found in natural environments. Their products restore and optimize skin to not only make skin look better, but make it healthier as well. The company is tremendously successful and is featured mainly in upscale boutiques and some highly esteemed resorts. Urban Outfitters, Terrain, and The Four Seasons Resort and Spa sell Farmaesthetics products because they promote sustainable beauty, use only certified organic herbs, and rival many of the leading dermatological brands. Their vast line of products is specifically categorized according to skin type making it easier for the consumer to benefit from products that perfectly compliment their unique skin.